Cortex from Superchips is the latest in the line of advanced vehicle performance programmers delivering economy, performance and power you can trust. Some independent programmer manufacturers take great pride in creating maximum horsepower from your vehicle while they subject your engine and drivetrain components to unnecessary stress, causing premature failure and expensive repairs. Superchips is so confident in the durability and compatibility of their Cortex programmer that they offer a two-year limited powertrain warranty. Cortex is engineered with Superchips dyno proven performance calibrations, cutting edge tuning, and data acquisition technology. 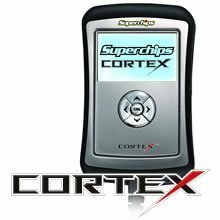 Another great feature of the Cortex is the ability to be updated via the internet - simply connect to your computers USB connection and go to Superchips.com for any updates and calibrations available for your vehicle." Last updated: April 20, 2019 at 11:59 EST. Pricing information is provided by the listed merchants. GoSale.com is not responsible for the accuracy of pricing information, product information or the images provided. Product prices and availability is subject to change. Any price and availability information displayed on amazon.com or other merchants at the time of purchase will apply to the purchase of the product. As always, be sure to visit the merchant's site to review and verify product information, price, and shipping costs. GoSale.com is not responsible for the content and opinions contained in customer submitted reviews.